Highland Maple launched their new Saint Q premium brand maple syrup at this year's Okanagan Fall Wine Festival. Saint Q is a new ultra-premium maple syrup brand made from Nordic White Maple trees. These rare sugar maple trees, a special highland “Rock Maples” are acclimated to cold harsh Canadian winters and have adapted to survive extensive cold periods. Combined with the nutrient-rich soil composition of the high plateau of Summerland, the terroir has a dramatic influence on the breadth and depth of the maple taste. The syrup is unique as it is from a single source with no blending, mixing, or adding of outside products, and its pedigree and provenance can be traced back 200 years. 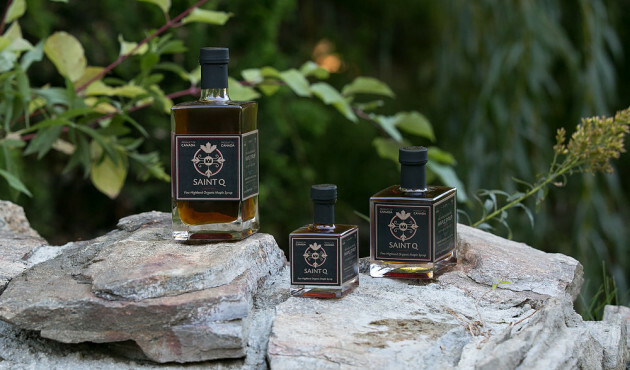 The Saint Q brand was created and designed in Summerland with silk tassels handcrafted by an 80-year-old Summerland resident, and bottles hand-labelled and packaged by members of the Summerland Resource Centre who are on long-term disability. Saint Q will be available on the new Highland Maple website at highlandmaple.ca, as well as at their new downtown location at 13207 Victoria Road North, Summerland.